Moving into a new home? Soon after unpacking all those boxes, you should run through a home safety checklist, just to make sure you and any family members will be as secure as can be in your new digs. We don’t want to make you paranoid, but as much as you’d like to think otherwise, hidden dangers could be lurking around every corner—from your dryer vent to your water heater. So give everything the once-over. And use this list to hit all the areas that could spell trouble down the road. This one is obvious, but the importance of checking your smoke detectors can’t be stressed enough. Make sure they’re properly installed, working, and clean. Consider the following statistic from the National Fire Protection Association if you need any motivation: 3 in 5 home fire deaths occurred in homes with no smoke alarms or nonworking smoke alarms. In fires in which the smoke alarms were present but did not operate, almost half of the smoke alarms had missing or disconnected batteries. The NFPA recommends installing smoke alarms inside every sleeping room, plus in the hallway on every level of the home. There are a million new things to buy when you move into a new home, but don’t scrimp when it comes to buying fire extinguishers—get one for every level of your home. If your home has a furnace that uses gas or oil, you should also have a carbon monoxide detector. More than 150 deaths due to accidental carbon monoxide poisoning are reported each year, and many of those deaths could be prevented by CO detectors. 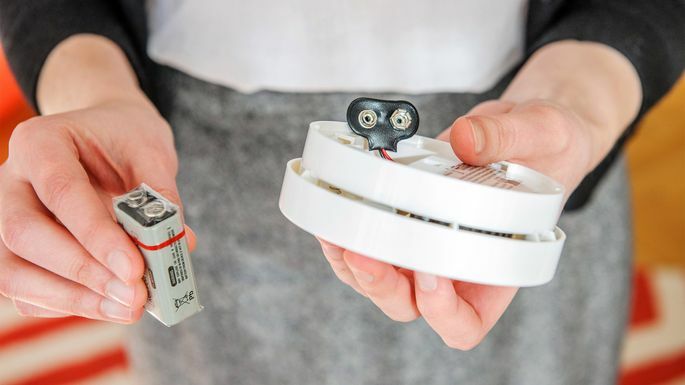 While many smoke detectors are also carbon monoxide detectors, there’s no guarantee the smoke detector in your home is a dual detector or that it’s working correctly. The U.S. Consumer Product Safety Commission recommends placing both smoke and CO detectors on every level of the home. Check your dryer vent. We’re not talking about the one that’s inside your dryer; we mean the big vent from your laundry room to the outside. Sure, it’s a hassle pulling the dryer away from the wall, but it should be done at least three or four times a year, as lint is highly flammable. In fact, an estimated 2,900 home clothes dryer fires are reported each year, and the leading cause is lint-filled dryer vents. Here’s how to clean a dryer vent. In case you do hear those smoke detectors go off, make sure you have an escape route for all members of the family. A long, hot shower after all of that moving probably sounds great, but check your water heater first to make sure things don’t get too hot. While the Consumer Product Safety Commission recommends setting a home’s water heater at 120 degrees Fahrenheit, some people hike theirs to temperatures so high they can be scalding, especially for children or the elderly. Few people think to check the quality of their exterior doors, but sometimes cheap contractors or house flippers will install an interior door as an exterior door, which can cause a number of issues. Interior doors are not built for insulation, so your energy bills could be higher. What’s more, these doors are also far less safe because they often have hollow cores and are not built to resist forced entry, says Jonathan Johnson, a home safety expert with YourLocalSecurity.com. If that fits your situation, consider getting a new one. You should also change the locks on your new home or have them rekeyed. While getting the keys at closing was probably exciting, it’s less than exciting to think of the potential number of people who might have been given copies by the previous owners. From baby sitters to neighbors to relatives, an unknown number of people might have a key (and instant access) to your home. Generally, window screens are designed to be removed from the interior of the home. However, if they’re installed backward—a surprisingly common mistake—they can make an easy entry point for thieves. No screen will stop a determined thief, which leads to our next point: window latches. Even if windows seem latched, it’s always a good idea to test them as if you’re trying to break into your own home. Older latches, especially plastic pieces, can break after extended use, yet show no obvious signs of breakage. Here’s one you probably won’t think about until bad weather hits: the weather alert apps you installed when you previously lived in another city, state, or country. Make sure to update them with your newest location before natural disaster strikes. The American Red Cross has a step-by-step guide to setting up emergency alerts. Kelly, EXIT Realty Beatrice Associates.